Today let’s talk about sales networks with Alberto Consani who committed, in years, to working in sales & marketing operations. After a long experience in multinational IT companies, he started to engage in developing new approaches to sales process through indirect channels. Alberto dedicates to this area every professional effort, surfing the tremendous evolution of sales in the age of internet: experimenting -though – that also traditional networks are a very strong tool for producers and network owners; they are still at the heart of every commercial endeavor and development. Alberto’s underlying philosophy is that sales are a complex process that, for historical and cultural reasons, in Italy is not managed like such; his a tout is an holistic and integrated approach, consisting of 4 essential ingredients and a very innovative use of proven technologies, that I will try to have him explain plainly. Alberto collaborates with Naima on these specific issues. AB: Alberto, there seems to be a renewed attention to network marketing, that is, the set of practices and tools that enable manufacturers and distributors to cooperate in control and development of new markets. Can you help us understand the evolution in action? AC: Yes Alessandro, though it is not something new that Manufacturers and Distributors constantly seek to settle the balance of power that characterized so far the business of distributing branded products; the news is the digital revolution that, on the one hand, gives the consumer/customer all the “information” about the product, and, on the other, (fortunately) still cannot substitute him in the choise or use of it. Therefore the Distributor has the opportunity to take on a new “value-added” role, in line with and taking advantage of this digital transformation: it can become a Partner of the Retailer, equipping it of tools and services to increase sales volumes and margins on that product, and it may collect and integrate informations on the Retailer, making them valuable analysis for the Manufacturer. AB: You claim that sales are essentially a matter of process and an holistic and integrated approach. The dominant culture – especially in Italy – has it that sales are made ​​of product, seasoned with talent, skills and relational systems. The methodical approach is a bit in the background, while, in the Anglo-Saxon culture, methodical approach to sales is considered the true discriminating factor. What do you think about it? AC: Well, in my opinion the ingredients in this recipe of success are only four: 1. those Processes (we call them “Best Practices”), which have already proved to determine the success of the leading companies in the sector … because after all it is useless to invent in a world full of good examples to imitate …, 2. People who are motivated and ready to change, 3. new cloud-based Planning tools and automation of sales force (this is the true and simple innovation) and 4. well-planned Programs of cooperation with indirect channels: these have to be easy to implement and measurable in its results. Regarding your remark about our domestic context, if it were really so, there would not be so many Italian companies with excellent product that, when faced with the commercial challenge abroad, realize to have forgotten that sales are as important as the product! AB: One of the key elements of your approach is that of the recovery of the technologies and systems already in use and the use of the cloud, right? AC: Honestly, I would not call it “recovery”, but repetitive and systematic use of basic elements, designed to be combined with a specific purpose. Let me use an example to explain better: take the Lego bricks. Everyone knows that with the same brick you can build an endless number of different constructions. The long-lasting success of this game derives from the sophisticated (and yet seemingly simple) system that holds together bricks of different sizes through a single standard mechanism of interlocking, with no screws or bolts. We can do the same thing in marketing operations, sales and cooperation, between the various business departments, and between the company and the various direct and indirect channels (no matter how sophisticated the multi-channel logic will be). And here I come to answer to your question: the Cloud is the mechanism by which you can almost magically build anything as with a Lego box. With the Cloud you can forget about the technology (extremely complex) to devote all available resources to design the best process for the specific company, at costs 70-80% lower (no kidding!) than the traditional IT achievements … and far better results; provided that those who assemble the bricks are “sales” expert and not computer expert! AB: I was too increasingly getting the sense that cooperative CRM platforms in the market were a little too rigid an instrument to organize sales activity and – in any case – a source of friction between the seller, who often does not get any tangible advantage in using it, and the company that wants to control his activity … You – instead – hold that these solutions, when used to model the sales process, are also useful to redefine the relationship between the network owner or manufacturer and the network, with obvious benefit for both. Can you explain how? AC: I am glad you asked! (A bit of rhetoric …). This is the key to everything else: what if I coiuld show you that with four ingredients of a recipe of success and realizing the “building blocks” of the sales process directly on the cloud? So that you can put together the manufacturer, the distributor and the dealer and maybe even the end customer, and you can actually “build” the business process so as to render the interaction of the various actors profitable for all. On the other side over 70% of investments in CRM fails or brings deeply disappointing results! But why? Well, around the traditional CRM there gathers a series of fatal errors: for example, you forget to model a sales solution so that those who must use it (the seller or the sales agent) will have an advantage in terms of efficiency, effectiveness and personal gain. How can you force an agent to do something that does not suit him, when he is an independent contractor, often multi-agent, attentive to the costs and returns of his activity and thus strongly inclined to spend his time where it is more favorable? Everyone knows it, but no one takes it into serious account when choosing a CRM platform, because that is still considered a choice of ‘a technological kind’. In the end, no one will want to associate with the poor results of the implementation phase; in the end the system will often sadly belong only to IT. AB: I think you made a clear point … Another aspect that intrigues me: we are used to think that a deep cooperative approach with networks can only take place in the forms of direct distribution or maybe very strict franchising formats. But you claim that these new approaches are very lean, effective and efficient also in non-exclusive sales mandates. How is that possible? AC: No matter what the contractual format, it is the “win-win” philosophy that really counts, that be franchise or contract of resale, distribution or agency. The contract governs the transfer of ownership and many other things created to protect the various players along the value chain. But here we are not talking about how to protect anyone, but how to develop business “together”, by sharing the benefits realized! We are talking about benefits realization! Moreover, this is also true in an organization with direct sales agents, where experience shows that you cannot appeal to the fact that a sales agent is an employee and therefore ‘obliged’ to do what the company commands. Here, too, if there is no personal gain for the sales agent, there lacks one of the two “win” and, in the end , the benefit will simply not come true even on the other part. AB: New tools and new methods … What is – however – the meeting and balance point between the partly conflicting objectives of the network-owners and their networks? We are accustomed to think of it as a dialogue essentially regulated by merchant fees … AC: The meeting and equilibrium point is the presence of a business model that works and a “business case” (only one) that promises attractive returns for both parties. If this is in place, you can always run and adjust everything else, provided you remember the 4Ps recipe! AB: Can you tell our readers where have you recently experienced these approaches? What are the metrics and the results? How long does it take to see the benefits? AC: As you know, I and my team have very recently achieved great results in the medical and telecom mid-market sectors, two areas where the sales process is very articulated and very competitive! Because of the cloud and the fact that we have already implemented most of the bricks needed, the go-to-market is far less affected by IT constraints. Anyhow, we are talking about a handful of months for companies of great complexity, and weeks for small or medium companies. Forget the long time of completion of a traditional CRM project. And forget also the dreadful risks related to it! Here you go ahead with a fast-prototyping fashion, that realizes (maybe partial but) immediate results and then will give you time to complete the picture. We call it ‘quick-win’, and it focuses the returns on most promising initiatives, reducing costs and time, and encouraging the momentum of a triggering imitative factor. AB: Many argue that the evolution of marketing sees the progressive collapsing of the traditional distinction between traditional business-to-business and business-to-consumer models, especially in terms of approaches and tools. All this would happen because of the availability through the cloud of communication and transaction tools, that were once the exclusive domain of one or the other segment. What do you think about it? AC: I totally agree. It is clear that for a while … well, it will still be different selling an aircraft carrier to the Navy Department of a foreign state from providing a pressure gauge to a pharmacy … but in fact, preserving the inherent complexity of the sale, there is always a manufacturer (the first B of the business) and a customer / consumer/ patient/ client at the other end of the deal. We have coined the acronym B2B2C+, just to illustrate this concept. AB: You have a strong international experience, and yet you decided to work from Italy and in Italy. Why? Do you think there is a case for the success of a radical innovation in sales method in this country? Is there some other professional reason? AC: For many years I worked as a luxury commuter with offices in London, Brussels, Amsterdam, and Dallas; part of a fairly large group of Italians with positions in foreign multinationals; … and I really enjoyed myself very much. Like many of my colleagues, I have proceeded in my career maybe faster than my German, French, Dutch, etc … colleagues, thanks to the magic combination of imagination and flexibility, typical of Italians, combined with the rules, processes and discipline of multinational corporations. In recent years I felt the vast majority of multinational companies were beginning to implode, just cutting costs and ceasing to innovate. Experts predict a future with very few large multinational companies still in business and a network of small and even very small companies that make innovation and dynamically aggregate also on very complex and large projects. That said, having the good fortune of being able to choose to do what I love most in my “second career” (as I call it), I have chosen to apply the best of what exists in the world (to which I draw thanks to my international network) to the Italian economic texture, where we all hope to undertake a second Renaissance; as you can see, I am an irreducible optimist! Thanks Alberto and best wishes for your second career, as you call it! 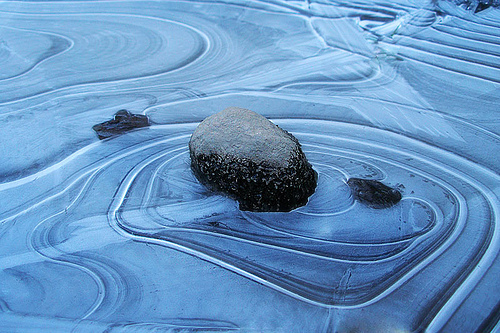 Image: in zen gardens a rock dominates over the sand thus influencing everything around. Its signage irradiates, communicating both its form and might. At the same time other rocks will generate their own influence in return, in an asymmetric wave of communication. Resembling fluid dynamics or maybe also a social network or the taxonomy of an articulated open system. Incredibly simple and effective.